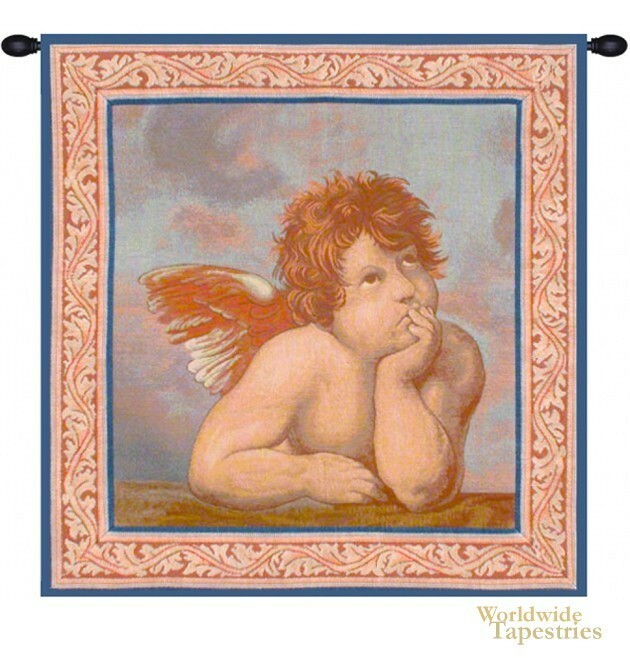 Angels (Left Panel) - Raphael tapestry woven in Italy shows the cherub from the Sistine Madonna. Raphael (1483 - 1520) created this work as an altarpiece for San Sisto in Piacenza in 1513-1514. Here we see the Renaissance interpretation of a cherub, as an adorable being, looking upwards towards the heavens. As an artist of the Renaissance with da Vinci and Michelangelo, this is one of the most well know works in the era. Here we see a stylised version of the original. This Renaissance tapestry is backed with a lining and a tunnel for easy hanging. Note: tapestry rods and tassels, where pictured, are not included in the price.